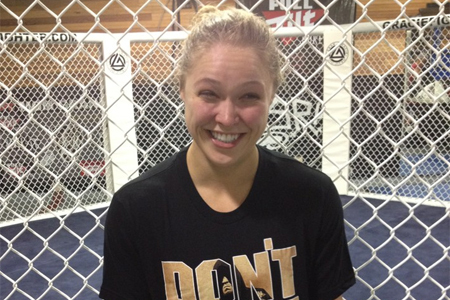 Once again, UFC bantamweight champ Ronda Rousey (Pictured) is hoarding the MMA headlines. Although, this time it’s for a completely different reason. Most fans have only witnessed the outspoken and brash side of the “Rowdy” one, but on Thursday night’s debut episode of “UFC 157 Primetime Rousey vs. Carmouche,” Rousey revealed her softer side by opening up about her late father. Rousey’s raw emotions riveted the MMA world. The last two installments of the three-part series will hit the airwaves on FUEL TV the subsequent Thursdays leading up to her big league debut on February 23rd. Rousey breaks in her belt against Liz Carmouche at UFC 157.